Parallel Computing [Planning and Scheduling Systems; Enterprise Resource Planning Systems; Supply Chain Modeling and Analysis; Discrete Event Simulation Software Development; Manufacturing System Simulation; Manufacturing Decision Support Systems; Just-in-Time Manufacturing System]. Kasemset, C. and Kachitvichyanukul, V. Bi-level multi-objective mathematical model for job-shop scheduling: the application of Theory of Constraints, International Journal of Production Research, (DOI: 10.1080/00207540903176705), Volume 48 Issue 20, 6137–6154, October 2010. Pongchairerks, P. and Kachitvichyanukul, V. A Particle Swarm Optimization Algorithm on Job-shop Scheduling Problems with Multi-purpose Machines, Asia-Pacific Journal of Operational Research (APJOR), DOI: 10.1142/S0217595909002158, Vol. 26, No. 2, pp. 161-184, 2009. Pongchairerks, P. and Kachitvichyanukul, V. Particle Swarm Optimization Algorithm with Multiple Social Learning Structures, International Journal of Operational Research, Vol. 6, No. 2, pp176-194, 2009. Pongchairerks, P. and Kachitvichyanukul, V. A Two-level Particle Swarm Optimization Algorithm on Job-shop Scheduling Problems, International Journal of Operational Research, Vol. 4, No. 4 , pp390-411, 2009. Ai, The Jin, and Kachitvichyanukul, V. A particle swarm optimization for the vehicle routing problem with simultaneous pickup and delivery, Computers & Operations Research, 36, pp1693-1702, 2009. Ai, The Jin, and Kachitvichyanukul, V. Particle Swarm Optimization and Two Solution Representations for Solving the Capacitated Vehicle Routing Problem, Computers & Industrial Engineering, Volume 56, Issue 1, pp380-387, 2009. Udomsakdigool, A and Kachitvichyanukul, V. Multiple Colony Ant Algorithm for Job Shop Scheduling Problems, International Journal of Production Research, Volume 46, Issue 15, pp 4155-4175, August 2008. Sirikum, J., Techanitisawad, A. and Kachitvichyanukul, V. A New Efficient GA-Benders Decomposition Method: for Power Generation Expansion Planning with Emission Controls, IEEE Trans. on Power Systems, Vol. 22, No. 3, pp. 1092-1100, August, 2007. Pongchairerks, P. and Kachitvichyanukul, V. A Comparison between Algorithms VNS with PSO and VNS without PSO for Job-shop Scheduling Problems, International Journal of Computational Science, Vol.1, No. 2, pp.179-191, June, 2007. Udomsakdigool, A and Kachitvichyanukul, V. Two-way Scheduling Approach in Ant Algorithm for Solving Job Shop Problems, International Journal of Industrial Engineering and Management Systems, volume 5, number 2, pp.68-75, 2006. Kungwalsong, K. and Kachitvichyanukul, V. Decision Support System for Integrated Planning and Scheduling, International Journal of Information Technology and Management, Volume 5, Number 2/3, pp.151-161, 2006. Honors Society : Alpha Pi Mu, Tau Beta Pi, Omega Rho, Sigma Xi . 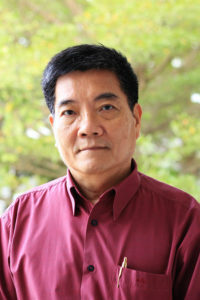 Senior Member of IIE .